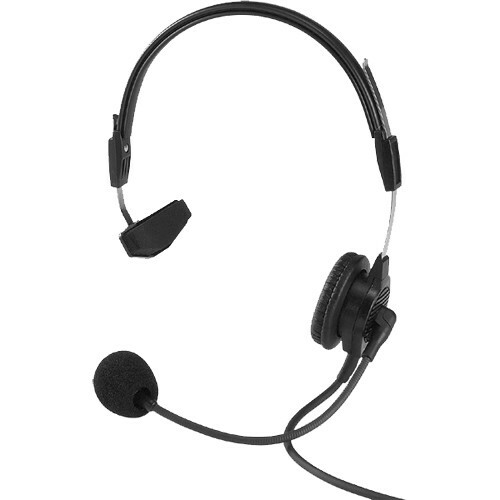 Comparably lightweight at 4.6 oz, the Telex PH-88 is a single sided intercom headset with a dynamic, noise cancelling boom microphone, and a padded adjustable headband. The semi-rigid gooseneck microphone boom is fully adjustable and easily positioned, and the earpiece features a moleskin covering for a comfortable and secure fit. The headset cable connector is a 4-pin XLR Female type. Box Dimensions (LxWxH) 10.3 x 8.8 x 2.8"
PH-88 - Lightweight Single Sided Intercom Headset is rated 4.9 out of 5 by 24. Rated 5 out of 5 by Anonymous from THE backstage headset. I'm a lighting guy. I've worn a PH-88 for years while running shows; I try to spec them from the audio guys when I can. I finally purchased one of my very own, as I was sick of said audio guys ignoring me and giving me a gigantic antique with an earmuff the size of my face. They are so light you forget you are wearing it. They are extremely adjustable, so you can avoid the dreaded headset headache. The boom swings all the way around, so you can switch ears at will. The best thing about these, however, is that you can beat them up and they'll keep going. They live forever! The cost is an irritant, but it's worth it for the comfort if you spend a lot of time on com. Rated 5 out of 5 by Anonymous from Great choice for stagehands After several years of swamp ear and headaches from bulky headsets, I decided to give a lightweight a try. My first attempt was with a lightwieght clearcom, which didn't stay on my head and was difficult to hear in loud settings. I then switched to the ph88 and have been incredibly happy with it. Overall it stays put on your head, has a small muff to help block some sound, but without the bulk. I highly recommend this for anyone in theatre-it will literally save you from many headaches. Rated 4 out of 5 by Anonymous from Very Comfortable These PH-88 headsets work great and are very comfortable. I am able to wear one for several hours at a time. They hold up fairly well when working with high school students. The foam pad on the ear piece wears out after a year, so I keep some replacements on hand. The only problem would be that they are basically disposable after a few years because other than resoldering a broken wire in the connector, they are not user repairable. Good price point too. Rated 5 out of 5 by Chris, TV Producer from Great headset -- TV control room I just bought this headset and am very happy with it so far. It is used in a TV production control room on a daily basis. The headset fits very comfortably, is light so it doesn't feel heavy on your head during extended use, and the sound quality is great. The cable is also long enough to walk a short distance from the console, which is very convenient. Rated 5 out of 5 by Karen - Opera and Theatre Stage Manager from Solid Product As a stage manager, this is exactly what I needed. It was recommended by my Head Sound to work with our system. It is comfortable, snug without being too tight, sound quality is excellent and will last awhile. Plus the price is very good for the quality of the product. I would - and have already - recommend this headset to other colleagues. Rated 5 out of 5 by Blackburst from The Standard in Lightweight Headsets I wear a lot of headsets, whether it's for general aviation or double-muf comms for sports or live TV. These are my favorite lightweight headsets for a quiet environment where I don't need sound isolation from a loud environment. Rated 5 out of 5 by MD the TD from Most Comfortable Headset I use the product as a stage manager to call corporate meetings and events. After 18 hours in the ballroom on intercom, this headset is still very comfortable because it is so lightweight. Rated 5 out of 5 by Ht from Great Product! This headset preforms great. Very Light and very comfortable. Great sound too. These are worn for approximately for four hours a session. The is no issues with comfort. Is the cord coiled or straight? Thank you. The PH 88 has a 6 foot straight cable ghardwired with a 4 Pin female XLR connector. Does this headset work with Portacomm BP-200 bodypack? We use it with the Portacom all the time. Works perfectly. Would this headset work with an Clear com set up? Yes it will work thats what we use them on. can a telex ph-88 headset connect to an I-phone? Not with the standard 4 Pin XLR cable. You may be able to re-wire or add an adapter, but you may still have impedance issues which will lower audio quality. Does it come with a case? Would like to keep it protected and in good condition while traveling. Except for the standard cardboard shipping box, there is no traveling case . However, the shipping cardboard box might be sturdy enough.